Trivandrum, 2 October 2012: Mathrubhumi group has launched the English edition of the popular travel magazine 'Yathra'. The magazine was released by Actor Mohanlal by handing over to tourism minister A.P. Anil Kumar. 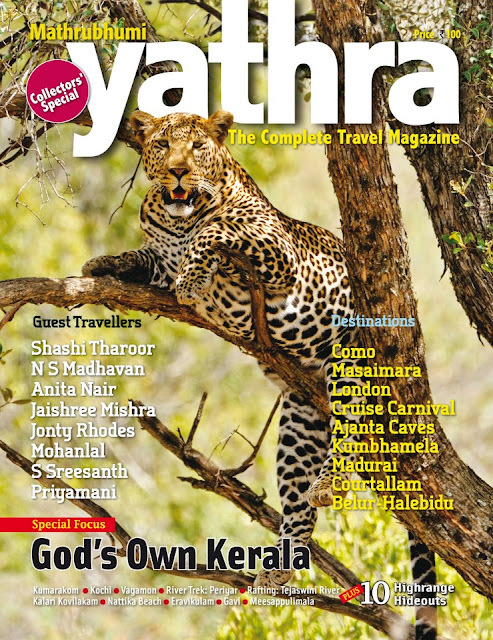 The Yathra Collectors Edition in English includes write ups by Guest travellers like Shashi Tharoor, NS Madhavan, Anita Nair, Jonty Rhodes, Jaishree Mishra, Mohanlal, s. Sreesanth, Priyamani etc. The magazine also features travel articles on London, Ajanta Caves, Madurai, courtallam, Como, Masaimara, Cruise Carnival, etc. The english edition is launched with a special feature on 'God's own Kerala' covering places such as Kumarakom, Kochi, VAgamon, Periyar, Kalari Kovilakam, Nattika Beach, ERavikulam, Gavi plus 10 Highrange hideouts in Kerala.